All A Bunch Of Momsense: I winned again! I came home tonight last night (took a little bit to finish this post!) from our Halloween begging from the neighbors Trick or Treating, and after throwing together a quickie pot of spaghetti, feeding 5 little tired people (C and G's mom and dad went to a party, so we have C and G.) I sat down to check emails. (And Tweets. And Facebook updates. And blog posts. I think I have an addiction issue! BUT, I also had to upload pics for Grandparents, because I failed to take any with my phone to post and I was going to be in trouble!) And I found out I winned again! 1) Must thank the person who gave the award and list their blog and link it. 3) Present this award to 7 others whose blogs you find brilliant in content and/or design, or those who have encouraged you. 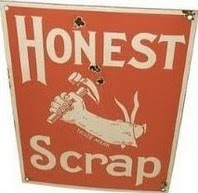 4) Tell those 7 people they've been awarded HONEST SCRAP and inform them of these guidelines in receiving the award. So, I will begin with a huge THANK YOU! to Karen! I can't wait to read more of her blog, and learn more about this wonderful sister! Ten Honest Things. This part might be harder. While I have no trouble telling the stories and secrets of my children, and even my husband, outside of the silly things from Not Me! Monday, telling on myself is harder. So, some of these will be pretty serious kinds of things, but there will still be some pretty off the wall ones, too! I was married to someone else before my husband. It didn't pan out. I won't go into the details, because we've both matured tremendously since that time, but there were a number of things in our relationship that were unhealthy, so we went our separate ways. I really, really REALLY like doing taxes. I like knowing that I can work the system in ways that are totally legal, saving taxpayers money, while making sure the taxpayers are paying their share. I am a procrastinator. I do my best work while under the final crunch of a deadline. (You know, like that one on April 15th!?) Ad copy, cleaning my desk, whatever it is, it's ALWAYS last minute. My coworkers are my best friends. I live with these girls practically 24-7 from January to April. One has been my BFF since high school, and is NOT a procrastinator. We never lived together. We knew it would kill our friendship. My first child was born out of wedlock. I was almost 22, and scared to tell my parents. I took my mom to lunch to tell her so that she either couldn't kill me, or if she did, there would be witnesses. I emailed my dad. Seriously. I dropped out of college after a semester and a half, and have kicked myself for it since. I had grants that covered my entire tuition and books. I could have had a free college education. Stupid, stupid Megan. I am extremely happy with my level of success professionally. So much so that I sometimes wonder if I would be nearly as happy if I HAD finished college. I even get to have initials after my name: E.A. I'm really into sports. College basketball, college and professional football, auto racing. I am NOT into baseball or professional basketball. I'll watch 'em, but usually only when it's championship type stuff. But the others? They're like a drug to me. I pushed God away for a long period in my life. I'm only recently getting comfortable with letting Him back in. It's hard, though, because my husband isn't there with me. One day. Not today, but one day. Speaking of my husband, we have learned how to tune each other out to a level that when we are communicating something that is important (like with our schedules and such- not REALLY important stuff, we can still talk to each other when we have a few minutes to do so!) we email each other. I can tell him something verbally, and he'll forget what I said. Same applies when he talks to me. I can hear my kids whispering upstairs, but not my husband speaking from the couch 12 feet away. He laughs- says the last thing we heard each other say was "I Do"! Now, my 7 blogs. These are blogs that are "Brilliant in content and/or design, or those who have encouraged me". I want to try to mention specifically what it is about these blogs that have hit me as I list them. MckMama : This woman has faced (and still faces) the life-threatening illness of her youngest child, personal attacks on her life as a function of her blog, stresses financially, marital struggles, and still lays it all out there for God, and gives back to those who need. I came to her blog based on a "Stellan" trending topic on Twitter, and was quickly hooked. Then, one day, she posted a post that opened my eyes, and my heart, and may well have saved my marriage. That's big. At least for me. Lyndi: I've known Lyndi for a long time, but we lost contact into adulthood. We recently re-discovered each other on Facebook, and I've been moved to pieces learning about her ever-growing family. She recently adopted a little boy with Down Syndrome from Eastern Europe, and is an advocate for special-needs adoptions. Elizabeth: Another mom here in the trenches! Elizabeth is one who, like me, works outside of the home, and ain't afraid to call it like she see's it! From pie to periods, she's willing to lay it all out on the table. Love that! Kate: I laughed like a loon at Kate's Wednesday this last week. Literal "LOL" moment. I need Kate to live closer so we can have tea and be mortified at WalMart together. Because, well, I've been there. Amber: This sweet momma is facing my biggest fear- the serious illness of a child. I am a huge advocate for pediatric cancer research and treatment, getting involved with groups like St. Jude and Alex's Lemonade after a little girl in my son's Sunday School class was diagnosed with neuroblastoma. The more I learned, the more I knew I needed to help. Amber's little girl Julia has been fighting like a trooper, and is WINNING, Praise God! Her bravery and strength in the face of such adversity is awe-inspiring. The Crayon Wrangler: I get a smile every time I read her "About Me" - she is working hard to raise her kids in great ways: I am teaching them to Color Outside The Lines. To define their own creativity and just be kids. While encouraging this freedom, I am also trying to get them to quit staining the carpet, stop pulling each others' hair, give me 5 minutes to go to the bathroom, say "please", "thank you" and "Amen". Isn't this the basics of what we all want for our kids!? YAY! Thanks for the award! Duly accepted!!! Loved, loved, LOVED your list of things! You totally deserve this!! Congrats!